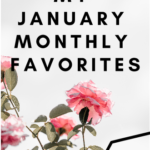 I think I am like most people in the sense that during the new year I crave a lot of change! I crave change in my health, relationships, mentality, probably change in the amount of ice cream I consume (or maybe not), and even my living space! I am someone who is greatly affected by my environment. Actually, I would argue that we all are! Colors, cleanliness, layout, every element of a room can translate some sort of mood and cause some sort of reaction. I know some of us feel lost when it comes to designing a room, but there are three essential components that can help you make any room feel like it was professionally done! Our first order of business is to consider what the room we’re designing is actually used for. Living rooms are used as places to converse and/or entertain so, the layout should translate that! Furniture should all be facing a midpoint to allow for easy conversations and to make sure no one has to strain their head or body to be a part of the fun! If it’s a dining room it should also be designed for entertaining. Key points to consider here are how many people you typically accommodate when hosting get-togethers. Are your dinner parties casual or are they more formal? If there are little ones running around and eating at the dining room table then you might want to choose fabrics that can easily be washed! Or, if you’re designing a guest bedroom, you want to make sure the room is as functional and comfortable for them as possible. Leaving extra toiletries in the bathroom, and making sure there is extra storage for them to store their clothes and luggage are great ways to make sure your guests feel right at home! All in all, think about the purpose of the room you are designing and the best way to make it as functional as possible! Everything in a given room should be to scale with the measurements of the room. For example, if you’re working with a smaller space, using big bulky furniture is going to make the room feel smaller and super crammed! If you’re working with a bigger space, using smaller furniture and art is going to make the room feel empty and disproportional. It’s important to make sure all pieces going into a room are to scale with the size of the room. This is a really easy way to make any room you are designing look professionally done! Every room should have an overall mood it conveys. Whether it’s bohemian, classic, contemporary, etc I think everyone tends to have at least one or two design styles they gravitate toward. When shopping for pieces to add to your room you will naturally gravitate to the things you like of course, but ask yourself if it is consistent with the vibe of the room and if it is harmonious with other pieces in the room. You wouldn’t pair modern pieces with farmhouse pieces. The room would look scattered and inconsistent where as when everything is conveying the same mood the room has harmony and is aesthetically pleasing to the eye! 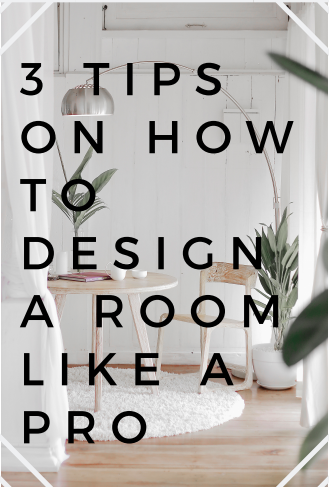 Those are my three most important tips when designing a room! 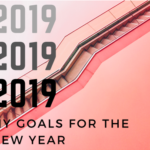 I hope this inspires you with either your new space for the new year or maybe to revamp your current space! I think it’s always fun to spice things up and these are the easiest ways to make it seem like you had your space professionally designed! You can thank me later once you start receiving countless compliments and everyone wants you to host the get togethers at your place! //What are your best tips when designing a room?// Let me know in the comments below!